The Season XVI WPT Tournament of Champions is around the corner. On Thursday, May 24, 2018, World Poker Tour title holders will embark on fabulous Las Vegas to compete in the prestigious event at ARIA Resort & Casino. The final table will play out at Esports Arena Las Vegas at Luxor Hotel & Casino on Saturday, May 26. In lead up to the event, WPT.com is featuring all of the winners from Season XVI, who, along with the hefty first-place prize, earned a $15,000 seat into the season-ending WPT Tournament of Champions. Next up is Maxime Heroux, who topped a field of 606 entries in the WPT Montreal Main Event to win $311,717. Season XVI WPT Montreal champion Maxime Heroux found his winner’s epiphany immediately after he earned his seat into the WPT Tournament of Champions. 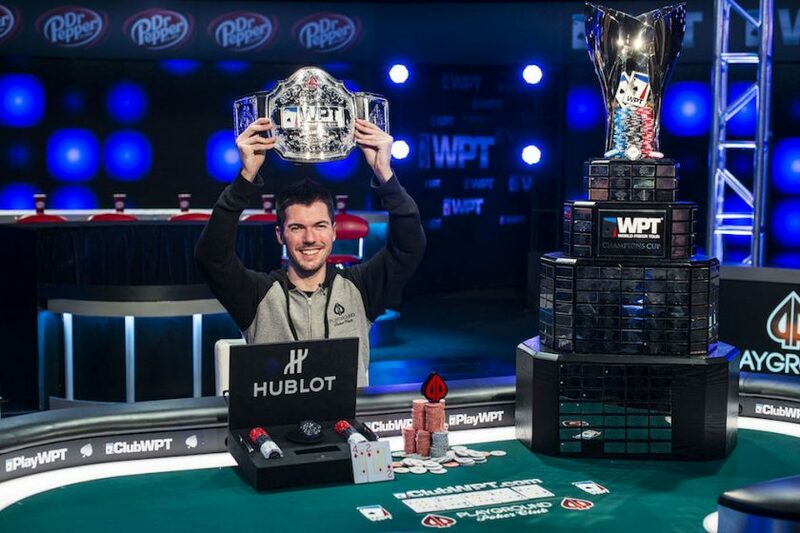 “I realized I was a WPT champion the day after the event when I rewatched the whole final table on PokerGO and had the belt next to me,” Heroux chuckled. So it goes for the the Canadian who took care of business in his hometown. Heroux’s results leading up to his win indicated a performance like the one he showed at WPT Montreal was possible. The French-Canadian took care of business at a tough final table inside his home casino at Playground Poker Club in Montreal. Six of Heroux’s eight career live tournament cashes have come in Canada. The Season XV WPT Montreal event featured a final two-table performance from Heroux. On the road to victory, WPT Champions Club member Eric Afriat fell by the wayside, as did elite performer David Peters. Soon, the title was Heroux’s. The confidence brimming from Heroux is natural. Entering the live streamed final table with a strong lineup in front of him, Heroux felt no fear. Heroux eliminated Hublot WPT Player of the Year contender Derek Wolters in third place by embracing variance and taking on a huge flip against Wolters. The pocket sevens of Heroux held against the ace-king of Wolters. Heroux finished off Pat Quinn in heads-up play to claim the title. Perform well is what Heroux did, as he displayed a precise knowledge of final table strategy and made quick work of the wall of competitors who stood in his way. Heroux’s victory places him in strong company with fellow WPT Montreal champions Mike Sexton, Ema Zajmovic, and Jonathan Jaffe. A similar task awaits Heroux at the season-ending WPT Tournament of Champions. The top cut of the game’s best are in the field and Heroux looks forward to the challenge. “The TOC excites me because I have never played a tournament with a buy-in that big and I will get to meet all of the other WPT champions and compete with them and maybe get lucky and come out on top,” Heroux said. Among the champions Heroux looks forward to rubbing elbows with is WPT Fallsview Poker Classic winner Mike Leah. Heroux voiced that he hopes to be the one who eliminates Leah from the event. Interestingly enough, Heroux was eliminated in 14th place at Fallsview to deny him joining Art Papazyan as a two-time champion in Season XVI. In the six months since his win, Heroux most enjoys having the select company that comes with induction into the WPT Champions Club. The name “Maxime Heroux” forever stays on the WPT Champions Cup, and Heroux says this is the first big win in his life. Heroux’s career remains the same. The $311,717 bankroll boost includes new options for cash games, but Heroux plans to maintain the level of tournament buy-ins played before his win. The WPT Tournament of Champions is exclusive for WPT champions only and Heroux has himself a seat for life in the $15,000 event. There is some history in the brief life of the WPT Tournament of Champions that bodes well for Heroux. In the two years of the event, champions from a WPT Main Tour event in Canada have made the money. Season XIV produced a cash for Season XIII WPT Montreal winner Jonathan Jaffe along with Season XV WPT Fallsview Poker Classic victor Darren Elias. In Fact, both reached the final table, with Jaffee finishing in fourth place for $95,400 and Elias taking sixth for $58,300. The next year, Jaffe cashed again along with Season XIV Fallsview champ David Ormsby. Jaffe min-cashed for $38,150, but Ormsby went on to reach the final table and placed fourth for $95,375. Perhaps Season XVI will bring Heroux and Leah together for a clash of Canadians. Heroux’s “happy to be here” mentality served him well at the WPT Montreal and it could very well pay dividends in the WPT Tournament of Champions. If he wins this tournament, he will have more proof of his success sitting next to him when the episode airs on FOX Sports Regional Networks later this year.